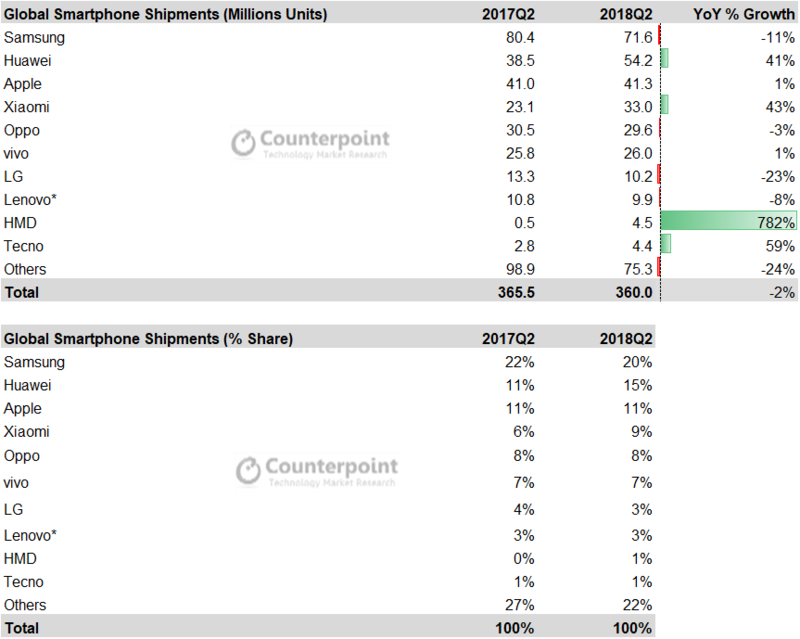 New data from Counterpoint’s Market Monitor service, shows that global smartphone shipments declined 2% annually in Q2 2018, to 360 million units. Samsung will be launching its Galaxy Note 9 flagship early to counter the string of premium segment launches by its competitors and to gain some momentum before the launch of new iPhone in September. It will also focus on launching newer models with high specs in each price segment, to counter the growing competition, Counterpoint said. The top 10 players captured 79% of the market, thereby leaving 600+ brands competing for the remaining 21% of the market. The weak smartphone demand is due to a slow-down in developed markets like China, US and Western Europe, where replacement cycles are lengthening. Huawei became the top brand in a declining China market and captured the second spot in the global smartphone shipment rankings for the first time in a single quarter, beating Apple. Its shipments grew 41% annually in Q2 2018. The company managed to be the fastest growing (21%) smartphone brand amid a declining China smartphone market, and grew fully 71% overseas. “Huawei had a good second quarter in 2018 as it shipped more smartphones than Apple to capture the second spot in the global smartphone rankings, after seven years of Apple-Samsung dominance,” said Tarun Pathak, associate director at Counterpoint Research. “Huawei achieved this by launching smartphones in the premium segment and capturing the mid-tier segment with its fast-growing Honor sub-brand. Huawei with its Honor brand is offering a broad and recently refreshed portfolio at affordable prices that is driving growth in the overseas market. LG registered 10.2 million smartphone shipments in Q2 2018. LG’s smartphone shipments declined 23% annually due to decreasing sales of its mid and low segment smartphones in North and Latin America. Lenovo (including Motorola) captured the 8th spot with a market share of 3%. While the Motorola brand registered an annual growth in shipments, it was eclipsed by the decline in Lenovo-branded smartphone shipments. Nokia HMD captured a spot on the global top 10 smartphone shipments ranking for the first time since its re-entry into the smartphone market. Nokia HMD has expanded its smartphone portfolio with a series of launches in the recent quarters, that helped the brand increase its presence globally. Tecno entered the global top 10 smartphone shipments ranking for the first time. Tecno, a major brand in Middle East & Africa, is positioning itself as a smartphone-only brand in some of the key countries including India. 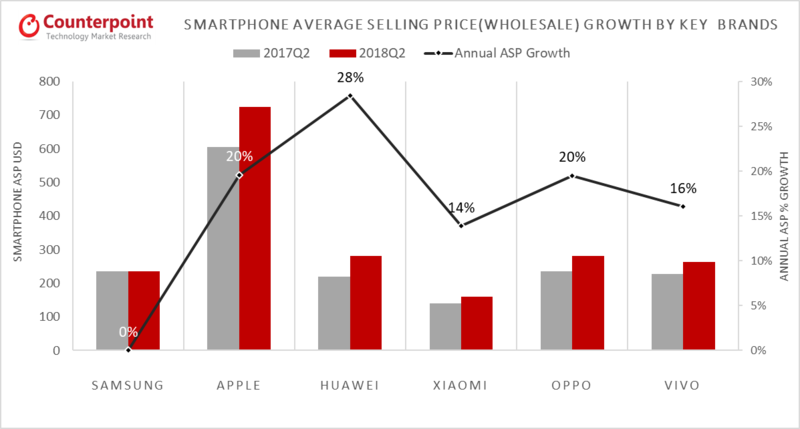 “Major Chinese brands like OPPO, vivo, Huawei are now focusing on increasing their ASPs through gradually upgrading their portfolio to higher price bands by bringing in features like Artificial Intelligence, bezel-less displays, dual cameras and with innovative industrial design and colors, materials and finishes in the affordable premium segment,” said research analyst, Shobhit Srivastava. Brands in the mid-tier segment now launch multiple variants of the same smartphone with different storage capacities, tempting customers to spend more on a higher spec’d device. “This also helps drive sales by increasing the portfolio breadth as well increased margins by selling devices with a higher price point,” Srivastava said.